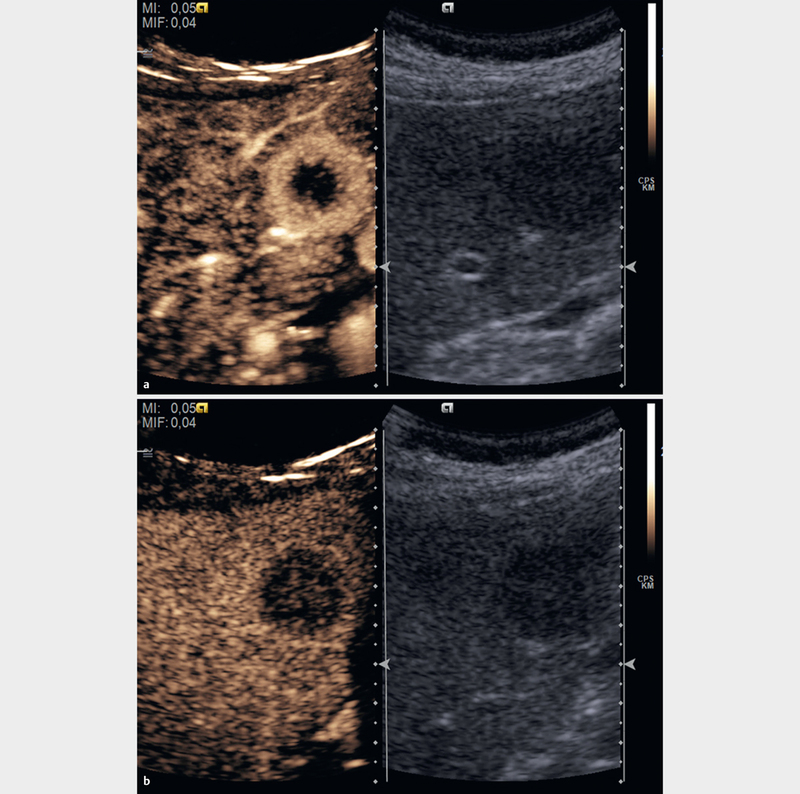 “How to perform contrast-enhanced ultrasound (CEUS)” provides general advice on the use of ultrasound contrast agents (UCAs) for clinical decision-making and reviews technical parameters for optimal CEUS performance. CEUS techniques vary between centers, therefore, experts from EFSUMB, WFUMB and from the CEUS LI-RADS working group created a discussion forum to standardize the CEUS examination technique according to published evidence and best personal experience. The goal is to standardise the use and administration of UCAs to facilitate correct diagnoses and ultimately to improve the management and outcomes of patients. The acronym CEUS refers to contrast-enhanced ultrasound techniques in general           . Dynamic contrast enhanced ultrasound (DCE-US) refers to quantitative time intensity curve (TIC) analysis    using either bolus injection of microbubbles     or intravenous infusion with disruption-replenishment technique  which are used for treatment response evaluation in oncology  and for activity assessment in inflammation of the bowel wall in inflammatory bowel disease    . 3D CEUS refers to image acquisition of data volumes. Introduced in 2002 , 3D CEUS is available in certain systems but it is still under investigation    . CEUS allows real-time recording and evaluation of the wash-in and wash-out phases of the ultrasound contrast agent (UCA) over several minutes. When examining the liver, this provides dynamic visualisation of different vascular phases. Owing to the specific supply of blood to the liver three different phases have been defined: the arterial (AP), the portal venous (PVP), and the late (sinusoidal) phases (LP)  . All clinically approved microbubbles, regardless of whether they are reticuloendothelial or purely blood pool, can easily be destroyed by ultrasound energy. This occurs most often by excessive or continuous scanning in a single plane, though it may also occur if the acoustic power is changed from the recommended value (typically less than 1%) to a higher acoustic power. Once the shell is disrupted, the gas from the microbubbles diffuses, and microbubbles lose their scattering properties and are no longer effective contrast agents. 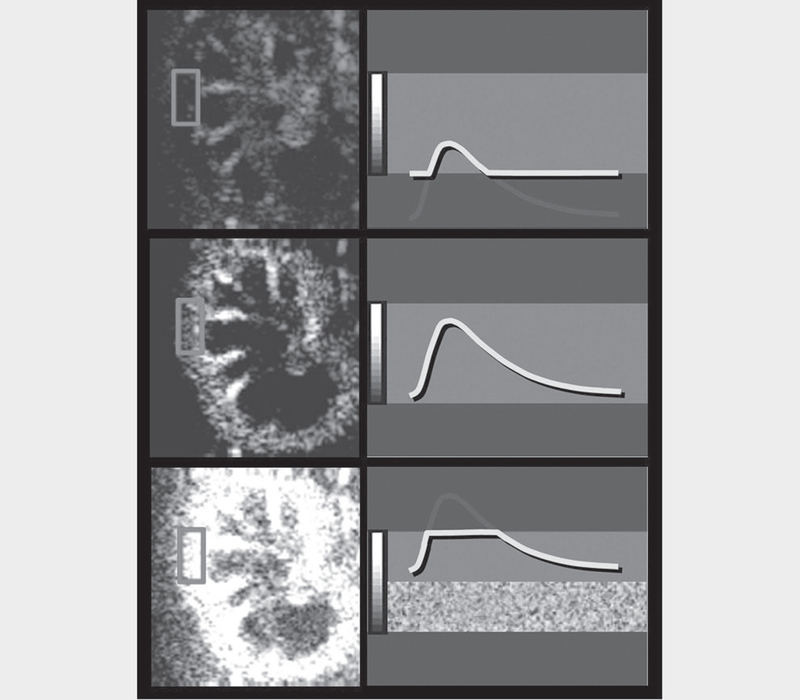 Microbubble destruction, therefore, results in time- and depth-dependent loss of contrast, which not only reduces image quality but can also lead to spurious signal loss that may mimic lesion washout. Reducing microbubble destruction is therefore important. Using optimal low MI settings reduces microbubble destruction to a minimal level. A useful sequence is to scan continuously and record a cine loop from the earliest arrival of the microbubbles to include the peak of arterial enhancement, and up to 60 s. Thereafter scanning should be intermittent, with storage of single images or short loops at about 30–60 s intervals to show the presence of washout. Vascular architecture (evaluated in the early wash-in phase). Contrast enhancement of the lesion compared to the adjacent tissue (time course of wash-in and wash-out). The combined evaluation of above diagnostic features makes it possible to characterize focal liver lesions (FLL) in healthy parenchyma     as malignant [Fig. 1] or benign [Fig. 2]. Fig. 1 Malignant focal liver lesions in healthy liver parenchyma show a variable arterial enhancement pattern according to their etiology (rim enhancement in the case of some metastases a and as decisive criteria hypoenhancement in the portal venous (sinusoidal and “liver specific”) phase in comparison to the surrounding liver parenchyma b. Fig. 2 Benign focal liver lesions in healthy liver parenchyma show a variable arterial enhancement pattern according to their etiology a and as decisive criteria iso- or hyper-enhancement in the portal venous (sinusoidal and “liver specific”) phase in comparison to the surrounding liver parenchyma b. The combined evaluation of the above diagnostic features makes it possible to characterize focal liver lesions (FLL) in patients with liver cirrhosis as typical for HCC according to the LI-RADS system (see below)    . Some contrast agents (such as Sonazoid™, BR14, BR38) are phagocytosed by cells of the mononuclear phagocyte system (reticulo-endothelium, e. g., Kupffer cells in the liver). Phagocytosis may start as early as the arterial phase and becomes pronounced in the late phase. This results in accelerated clearance of the agents from the vascular distribution volume . These UCAs persist significantly longer in the liver parenchyma than purely vascular agents so that a fourth phase, the post-vascular phase (also known as the Kupffer cell phase), can be defined. For these reasons, transit times and time intensity curves (TIC) differ for purely blood pool versus reticuloendothelial UCAs. The latter should not be used to evaluate hepatic transit times, as they do not reflect the hepatic kinetics. The contrast behaviour of a lesion or region of interest in the liver described in terms of the degree (relative to the adjacent parenchyma) and timing (phase) of enhancement is discussed in  . It is important to know in advance if the liver is healthy or diseased (e.g, liver cirrhosis, fibrosis or steatosis). This may affect the contrast behavior of the lesion and liver parenchyma as well. Enhancement refers to the intensity of the signal relative to the adjacent parenchyma as isoenhancing, hyperenhancing and hypoenhancing. Sustained enhancement refers to continuation of the same or greater intensity of enhancement in the lesion relative to the adjacent parenchyma over time. It applies to lesions that are iso- or hyperenhancing in the arterial phase. Complete absence of enhancement can be described as non-enhancing   . Describing the degree of enhancement is preferred although some authors designate the degree of vascularity of a region relative to adjacent liver as hypervascular, isovascular, hypovascular. The term “vascular” may be incorrect from a histologic, as well as physiologic, point of view. It should be clarified that imaging major vessels, likewise by Doppler technique, is defined as vascularization. The definition of perfusion is “volume of blood per time per mass of tissue” (unit: ml/min/g tissue)”. To know this is relevant for tissues with volume pulsation (e. g., the myocardium). By using CEUS, both vascularization and relative perfusion can be imaged. Both terms are sometimes used interchangeably without clarification. The enhancement pattern should be described separately for the different phases discussed above. Conventional, but imprecise time points separate these different phases (see also “contrast phases of enhancement”) . By convention, however, the timing of events on CEUS is routinely recorded by its actual time in seconds as shown on a visible timer on the scanner screen. “Wash-in”, used for both qualitative and quantitative analyses, refers to the progressive enhancement within a region of interest from the arrival of microbubbles in the field of view, to “peak enhancement”, and “wash-out” to the reduction in enhancement which follows peak enhancement  . As explained above, the timing (early versus late onset, fast versus slow), degree (complete, incomplete) and pattern should be described in comparison to the surrounding “normal” parenchyma. The characteristic features of a TIC analysis are shown in [Fig. 3]  . This model for quantification of tumor vascularization was applied in multicentric studies validating the AUC as predictive marker  . Fig. 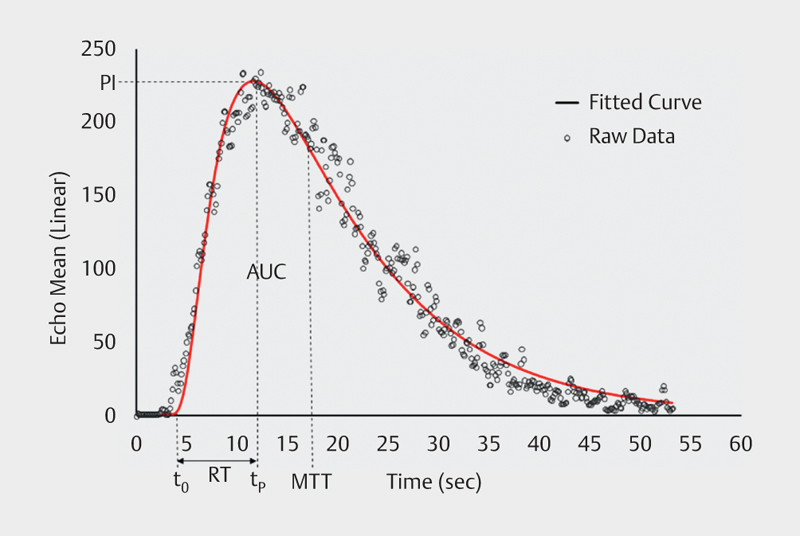 3 Time-intensity curve for a bolus injection in a tissue mimicking flow phantom. A lognormal curve (solid line) is fitted to the data and it is used to calculate the important quantification parameters (44) (PI, RT, MTT, and AUC). Only machines that offer nonlinear imaging modes designed for contrast imaging should be used. Where there is a choice of modes, those designed for low MI abdominal scanning should be selected. While in these modes, settings like “high resolution” or “penetration” are often available. These change a host of parameters together and can help adjust the scanner when optimizing a particular examination. These settings should be tried before attempting to adjust the MI or the dose of agent (see below). Once in a low MI contrast mode and the agent is in the patient, reverting to a non-contrast mode will immediately raise the MI and destroy the agent. This should therefore be avoided. Transducers that have specific CEUS optimized settings are recommended. 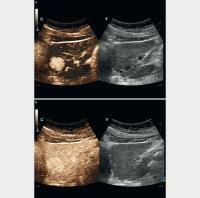 For liver imaging, curvilinear arrays are preferred for most cases. Linear probes with higher transmit frequencies may be useful in cases of superficial lesions and when more spatial resolution is necessary. In this case, higher contrast doses may be beneficial (e. g., thyroid, breast, lymph nodes, prostate), as the agents become less efficient nonlinear scatterers at higher frequencies. Typically, at low MI FLL up to 12–15 cm in depth can be imaged. At larger depths (and depending on the system used, and the patient’s condition, e. g., cirrhosis) it may be difficult to visualize lesions. Lower transmit frequency can be selected using the same transducer or lower frequency transducers allowing better penetration with the disadvantage of lower spatial resolution, eventually resulting in suboptimal imaging of small superficially located lesions. Increasing the MI may improve penetration but at the expense of microbubble destruction especially in the nearfield. In general, where there is a choice of amplitude or power modulation imaging modes, these will have better depth penetration (though somewhat poorer resolution) than pure pulse inversion modes. The focus should be positioned just deep to the target lesion for most ultrasound scanners . Deeper focal zones might be used to achieve a more uniform acoustic field, which improves sensitivity to the agents and lessens the risk of bubble disruption. Other focus positions have been proposed for quantification studies . Gain refers to the received signal amplification. For CEUS the gain usually is set very slightly above the noise floor so that before microbubbles arrive, the image is dark and with a “hint” (very low level) of noise. If the gain is set too low (image starts out too dark), weak microbubble signals are not detected and only signals from larger vessels are recorded. If the gain is set too high (image starts out bright and grainy even before the microbubbles arrive) the received echoes from the bubbles are clipped after a certain amplitude (signal saturation [Fig. 4]). Fig. 4 Low gain setting results in underestimation of the microbubbles located in the microcirculation (a). The proper gain setting results in a correct display of microbubbles in both micro- and macrovessels (b). High gain results in signal oversaturation and the image is too bright making the distinction between macro and micro-vasculature more difficult (c). Acoustic shadowing is the depth-dependent reduction in ultrasound amplitude due to excessive scattering from microbubbles. The nearfield microbubbles obscure and “shadow” the far field ones. Acoustic shadowing is due to excessive dose of UCA or increased microbubble concentration. The UCA dose should be adapted to the patient and the clinical indication. CEUS is always performed with low MI to avoid bubble destruction and harmonic signal generation from tissues. Typically, modern high-end diagnostic ultrasound scanners should effectively suppress tissue signals at low MI’s over the entire depth to enhance the visualization of microbubbles. The use of a dual-image display format is essential in CEUS studies and it is recommended especially in examining small lesions. In this display format, a conventional B-mode low MI fundamental image and a bubble-only contrast image are displayed side-by-side. The reason this is useful is that the nonlinear image is almost completely black (before contrast administration and under ideal conditions) making it difficult to keep the lesion of interest in the image plane. Having the conventional image displayed simultaneously allows the operator to keep the lesion in the imaging plane. Using the B-mode image for guidance, place calipers on the target lesion on both screens simultaneously to facilitate enhancement characterization. It is also possible to overlay the contrast and low MI fundamental B-mode plane image. For quantitative studies, it is critical to maintain the transducer at the same place and avoid motion. Pronounced hyperechoic lesions may still be visible on the contrast image before the arrival of the agent. TIC will help to better define the wash-out characteristics in these cases. It should be noted that in most systems, the quality of the B-mode image in dual-image displays is inferior to that obtained with the same settings in non-contrast mode. The compression or dynamic range of the ultrasound system also plays a key role in microbubble visualization. A small dynamic range is preferred in cases of very low signal and a wide dynamic range is preferred when the objective is to perform quantification (to avoid signal saturation). The dynamic range should be set to optimise the expected enhancement pattern. The dynamic range is the range of signal intensities to be displayed. A wide dynamic range increases the number of signal levels (“grey levels”), allowing for better differentiation between different degrees of enhancement. A small dynamic range will decrease the number of “colours” in the image and increases visual contrast but can limit the differentiation between areas of variable enhancement. For example, in a vascular metastatic lesion there is often a rim of increased signal surrounding the lesion. If the dynamic range is set too narrow - the rim will be displayed in the same “colour” as the lesion and the increased signal in this area may not be appreciated. Lowering the dynamic range will let the vessels stand out brighter, but it should not be too low that the gray or colorized bubble image suffers in contrast resolution. With a large dynamic range, the increased rim of signal can be better identified. For visualisation of lesions with low perfusion, a narrow dynamic range is preferred. For perfusion quantification studies, a wide dynamic range should be used to avoid signal saturation. It should be noted that reducing the dynamic range can increase the apparent difference between lesional and parenchymal enhancement. If acquiring a series of cases whose appearances are to be compared, it may be advantageous to keep the dynamic range and other postprocessing settings constant. A frame rate ≥10 Hz is recommended for adequate visualization and recording of the wash-in patterns when characterizing focal liver lesions (FLL). The contrast wash-in may only be visualized for about a second in some highly vascularized lesions and is best appreciated using retrospective frame-by-frame cine review. Moreover, a high frame rate is also important during sweeps of the liver to detect lesions so as to avoid skipping significant regions of the organ . However, increased frame rates can augment bubble destruction, and decreasing the frame rate in the late vascular phases will prolong the enhancement time. The Acoustic Pressure Amplitude (P) refers to the peak negative amplitude of the ultrasound pulse used for imaging. It is measured in Pa and is used in the calculation of the Mechanical Index (MI). The MI is an estimate of the maximum peak negative acoustic pressure in the tissue within the acoustic field scaled by the square root of the center frequency. MI is related to the likelihood of cavitation and the US Food and Drug Administration (FDA) limits the maximum MI to a value of 1.9 [when P is measured in MPa and frequency in MHz]. In addition to the MI, which refers to the highest value in the acoustic field, some manufacturers also estimate and display the MI at the focus zone or the percentage of maximum acoustic power that allows finer tuning of the acoustic energy delivered . It is important to note that there is a direct linear relationship between P and the MI (within linear acoustics). Choosing the appropriate MI is important for effective CEUS because as summarized in  this parameter affects several processes relevant to image quality and microbubble behaviour. These parameters are listed below and discussed in more detail later. The degree and rate of microbubble destruction. The depth of ultrasound beam penetration. The ability to separate signals scattered from background tissue versus those scattered by microbubbles, since tissue scattering is linear at low amplitudes (low MIs) while microbubble scattering is non-linear at all amplitudes. While the MI on-screen labelling is mandated by the FDA, manufacturers nonetheless use different calculations to arrive at this number. In practice, for contrast imaging, the number is not transferrable between machines. Thus, an optimal MI for a particular patient scanned with one machine may not be the same as for the same patient scanned with another. UCAs consist of gas microbubbles coated with a shell, usually comprised of phospholipid or albumin. Microbubbles act as resonant scatterers, increasing the backscatter signal by up to 30 dB, and producing echoes with characteristic harmonics. All UCAs are blood pool agents, but – as discussed earlier – some are pure blood pool agents while others are phagocytosed by reticulo-endothelial cells, causing their appearance to differ in the liver-specific late phases. UCAs are extremely safe with low incidence of side effects  and no cardio-, hepato- or nephrotoxic effects. Therefore, it is not necessary to perform laboratory tests to assess liver or kidney function prior to their administration . The pre-contrast examination preparations include the identification of the best position of the patient, the identification of the target lesion and the optimal scan plane along the axis of the respiratory movements (usually longitudinal) to minimize out-of-plane motion from respiration. The optimal patient breathing position is determined and practiced with the patient prior to the contrast injection. Quiet breathing and breath suspension in neutral are preferred over breath hold in full inspiration or expiration. The best position of the patient should be determined during the pre-contrast examination and this may affect which arm is chosen for injection. In most circumstances, the cannula should be inserted in the left arm, preferably the antecubital vein, to avoid interaction of the injector with the right-sided examiner. Be aware of other important influencing factors, e. g., avoid the side of breast (or axillary) surgery to minimise the risk of worsening lymphedema. Ideally, the diameter of the venous line should be 20 gauge or larger to minimize microbubble destruction during passage through the cannula, with its length as short as possible. Central line and port systems can be used as long as there is no filter requiring a high injection pressure. Their use will shorten contrast arrival time . In cases of difficult venous cannulation, US guided needle placement using a high frequency linear probe is recommended. The catheter can be removed after exclusion of any kind of pseudoanaphylactic, e. g., 15 min after contrast injection. A three-way stopcock may be valuable, especially if multiple injections are anticipated, as this facilitates sequential administration of the contrast material and then the saline flush, without removal of either syringe. The injection bolus for SonoVue™ is given at about 1–2 ml/s. Avoid high pressure (risk of microbubble destruction). Immediately after injecting the contrast agent, a (5-) 10 ml saline bolus should be given to flush the line at about 2 ml/s  . Central venous lines and ports may be used for CEUS if necessary if safety and aseptic requirements are met, but their use is discouraged if a peripheral vein can be accessed. Injecting UCAs through a central venous line or port requires a higher level of expertise to ensure a successful injection. Bubble disruption may also be increased necessitating a dose increase. The use of a central venous line requires a 3-way stopcock. Contrast arrival times are usually significantly shorter in case of a central-venous administration, a fact which might favour starting the timer earlier, at the beginning of the contrast injection. Using the optimal dose is important. Too high a contrast agent dose results in artefacts, particularly in the early phases of enhancement. These include acoustic shadowing, over-enhancement of small structures and signal saturation, which is also detrimental for quantification. On the other hand, too low a dose causes the concentration of microbubbles to be subdiagnostic in the late phase, challenging the detection of wash out. If the liver washes out early, the dose was probably too low or inherent significant intrahepatic shunting may prevent a longer enhancement time. Again, it is important to evaluate the status of the liver as being healthy or diseased. In difficult cases, a second (higher) dose may be administered, with no or only limited scanning in the early phases  to reduce bubble destruction. The exact dose depends on the UCA, ultrasound equipment (software version, transducer), type of examination, organ and target lesion, size and age of the patient and other factors. For SonoVue™/Lumason™, 2.4 ml (1/2 vial) is recommended for most indications in the liver (detection, characterisation) but many investigators are now using 1.2 ml (this topic has been controversially discussed with co-authors and the reviewers). For SonoVue™/Lumason™, 2.4 ml (1/2 vial) is the standard dose for most indications in the pancreas, spleen and kidney. For the pancreas, spleen and kidney, 1.2 ml often suffices. Depending on scanning conditions and depth of the lesion (organ) even lower doses can be used. For high frequency applications 4.8 ml is suggested. In particular, endoscopic ultrasound usually requires the complete vial of 4.8 ml   . For the extravascular (intraluminal) use only few drops diluted in normal saline solution are necessary. For Definity™ and Optison™ a standard dose is 0.2–0.3 ml for an adult. For Sonazoid™ a dose of 0.015 ml/kg (e. g., 0.5–1.0 ml) of the reconstituted suspension is recommended. Multiple injections of UCA are variably indicated and influenced mainly by the manufacturing of the different solutions and the volume needed to provide good visualization of the liver and a focal liver mass. SonoVue™/Lumason™, supplied in a 4.8 ml aliquot may allow for two or possibly three or four injections per vial, whereas Definity™, supplied in a 1.3 ml vial, which expands to 1.8 ml in solution may allow for multiple injections as needed (easily 6 or 7) as a standard bolus would generally be only 0.2–0.3 ml. For Sonazoid™ supplied in a 2 ml vial, a dose of 0.5–1.0 ml per injection (0.015 ml/kg) is recommended. There are additional nodules or observations, which require characterization. The initial injection may not provide the full answer to the characterization of a lesion, requiring a second injection to allow for assessment of missing information. A wash-out region may be identified on sweeps of the liver in either the PVP or the LP. Even if a corresponding nodule is not visible on the conventional B-mode images, arterial phase enhancement in the wash-out region can be characterized by re-injecting contrast material while keeping that region in the field of view. For the first two indications above, the examiner usually should wait before reinjecting until the bubbles from the previous injection have disappeared or least greatly reduced, which usually requires 10 to 15 min for SonoVue™/Lumason™ and Definity™ also depending on patient age and constitution. The waiting period is much longer for Sonazoid™, the disappearance of bubbles may take longer than one hour. To expedite bubble destruction and reduce the delay for re-injection, continuous scanning at high MI, such as B-mode or colour Doppler can be performed including the heart and kidney. To assess arterial enhancement of a wash-out region that does not have a correlate on B-mode imaging, by comparison, the examiner should re-inject before bubbles have disappeared so as to maintain visibility of the wash-out region. 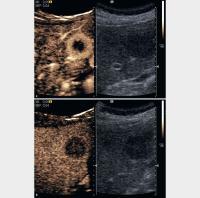 Dynamic real-time characterization of focal liver masses with CEUS is best performed with a bolus technique. However, measurement of blood flow parameters for assessment of oncologic response to therapy is also possible with an infusion and the destruction-replenishment technique. The agent is, depending on the contrast agent, suspended in saline or other media and intravenously infused with controlled pressure, to avoid bubble destruction and at a constant rate to permit prolonged scanning. This technique provides a steady-state bubble concentration which can be used with the burst and replenish mode (manoeuvre) to generate multiple measurements. For Definity™, where bubble flotation is not usually an issue, the agent can be mixed in a 50 ml saline bag. For SonoVue™, a dedicated infusion pump is recommended. For more details see the EFSUMB guidelines . All ultrasound scanners must have a visible timer. This timer should be started at the time of the beginning of the UCA injection for SonoVue™/Lumason™. With Definity™, no CA enters the body prior to the flush. The authors controversially discussed when to start the timer. Most (but not all) of the group agreed that the timer should be started at the beginning of the contrast injection. The application via a central venous line with much shorter arrival time is a good reason for this. It should be noted that in special situations (e. g., right heart insufficiency) contrast phases may appear at unusual time points including potential initial retrograde inflow via the liver vein. A pseudo-enhancement of tissue has been reported in the literature where targets in tissue are registered as bubble signals   . It has been suggested that the artefact is the result of nonlinear propagation of ultrasound in tissue perfused with a high concentration of microbubbles. The presence of microbubbles effectively increases the nonlinear coefficient of the “bulk” medium causing some nonlinear propagation to occur despite using low MI to prevent this phenomenon. Thus, when bright targets are encountered in the ultrasound path they produce echoes with nonlinear components caused by nonlinear propagation rather than by microbubble scattering. This pseudo-enhancement can be differentiated from true bubble signals by recognizing their non-physiologic nature, or by comparing the bubble image with the tissue image and identifying the same bright targets in both images. A way to reduce this artefact is to avoid high doses of contrast agents, and/or avoid having a large vessel in the ultrasound path proximal to the area/lesion of interest. In clinical practice, this is problematic most often in the follow up of treatment sites following ablative therapy for liver tumours . A bright echogenic focus within the treatment zone may show linear artefact which may be mistaken for residual or recurrent tumour. Clues to the correct interpretation include lack of arterial phase enhancement dynamics, when a real tumour would be perfused, and increasing pseudoenhancement in the portal and delayed phases attributed to the nonlinear artefact as bubbles fill the portal system. The ideal is to find a good compromise between the contrast agent dose and the equipment-specific settings. The MI and the transmit frequency (“penetration mode”) play a crucial role here. This balances the signal intensity and penetration on the one hand, and the stability of the microbubbles on the other hand. A higher MI results in a stronger signal and better penetration but also increased destruction of the microbubbles. The contrast agent dose balances the contrast enhancement intensity in the early phase (prevention of the over saturation of structures with shadowing) and the contrast enhancement duration (sufficient contrast agent concentration in the late phase). The CEUS “circle of disaster” is characterized by the following criteria: Microbubble destruction → increase in contrast agent dose →attenuation (shadowing) → higher mechanical index → additional microbubble destruction   . In conclusion, if the MI is too high, an increase of UCA dose to compensate may cause additional attenuation. Further influencing factors are gain, dynamic range, frame rate, transmission frequency, and equipment software . Most often, the default settings on the machine provide an excellent starting point for beginning CEUS studies of the liver. For more details on CEUS artefacts we refer to the current literature      . Prolonged innocuous liver enhancement after the bolus injection of microbubble contrast agents appears as a heterogeneous enhancement in the liver during the performance of the CEUS examination, often beginning at around 2 min and lasting up to 5 h after contrast injection on both B-mode and contrast-specific modes. It is not destroyed by conventional B-mode imaging. The enhanced signals can also be observed in the portal and superior mesenteric veins, though not in the systemic circulation . It is similar in appearance to the US finding of free portal venous gas. As mentioned earlier, UCAs are safe with a very low incidence of side effects. As there are no cardio-, hepato-, or nephro-toxic effects, it is not necessary to perform laboratory checks to assess liver, renal or thyroid function before administration. The incidence of severe adverse events is lower than with current X-ray contrast agents and is comparable to those encountered with MR contrast agents. Life-threatening anaphylactic reactions in abdominal applications have been reported with a rate of 0.001%, with no death in a series of >23,000 abdominal patients . Further studies have reproduced this very low adverse event rate  . Nonetheless, investigators should be trained in resuscitation and have the appropriate facilities available to react in cases of adverse events  . In particular, each centre should be prepared with a crash chart and ability to treat anaphylactic shock if it occurs. The use of CEUS in children, first reported in 2002, has been addressed in an EFSUMB position statement discussing the current status of CEUS and its further development in children . Currently sulphur hexafluoride gas microbubbles (SonoVue™/Lumason™, Bracco SpA, Milan) has been approved in the United States by the Food and Drug Administration (FDA) as Lumason™ for characterising focal liver lesions in children [“Lumason is indicated for use with ultrasound of the liver in adult and pediatric patients to characterize focal liver lesions”] and vesico-ureteral reflux. In Europe, CEUS in children is mostly “off-label” use, except for a few indications including vesico-ureteral reflux . The same is true for many drugs, which are used off-label in paediatric practice and the question of “off label use” has been widely discussed  . The recent approval of SonoVue™/Lumason™ for use in paediatrics in the United States is a welcome first step towards the acceptance of this technique in the non-ionising imaging of children . CEUS-guided interventions for practical considerations is performed very much like a standard US guided procedure except that two injections of UCAs are used, one to plan the procedure and a second to guide the actual intervention. In some cases, a continuous infusion may be the better choice while in other cases the procedure may be performed without a second contrast injection if the perfusion conditions are adequately demonstrated with the first CEUS to allow for a standard ultrasound guided procedure. CEUS-guided biopsy has been reported to increase the diagnostic accuracy rate by up to 10% either by directing the biopsy towards contrast-enhanced – and thus viable – tissue inside the tumour and thereby avoiding sampling of necrotic material, or by identifying previously not-visualised lesions more accessible for biopsy      . Furthermore, CEUS may visualise active bleeding, hemobilia or segmental liver infarction. CEUS is also helpful in performing and follow-up for radiofrequency ablation or cryotherapy for hepatic and renal masses   . CEUS allows evaluation of the extent of the ablated zone at the end of the procedure. If residual tumour is identified, the ablation can be extended after repositioning the needle to the residual tumour using CEUS guidance. On follow-up studies, CEUS is able to identify - immediately following treatment - small amounts of residual tumour, which can be too small or too soon to detect with CECT or CTMRI  . Extravascular (intracavitary) CEUS (EV-CEUS) is used for imaging physiological and non-physiological body cavities. Physiological cavities include the peritoneal cavity, pleural cavity, biliary tract, gastrointestinal tract, urinary tract, etc. and pathological cavities include abscesses, cysts, diverticula, etc.  . The UCA is given through a needle or catheter, for instance, at cholangiography or nephrostomy. However, UCAs can also be given orally or as an enema for imaging the upper and lower gastrointestinal tract  . 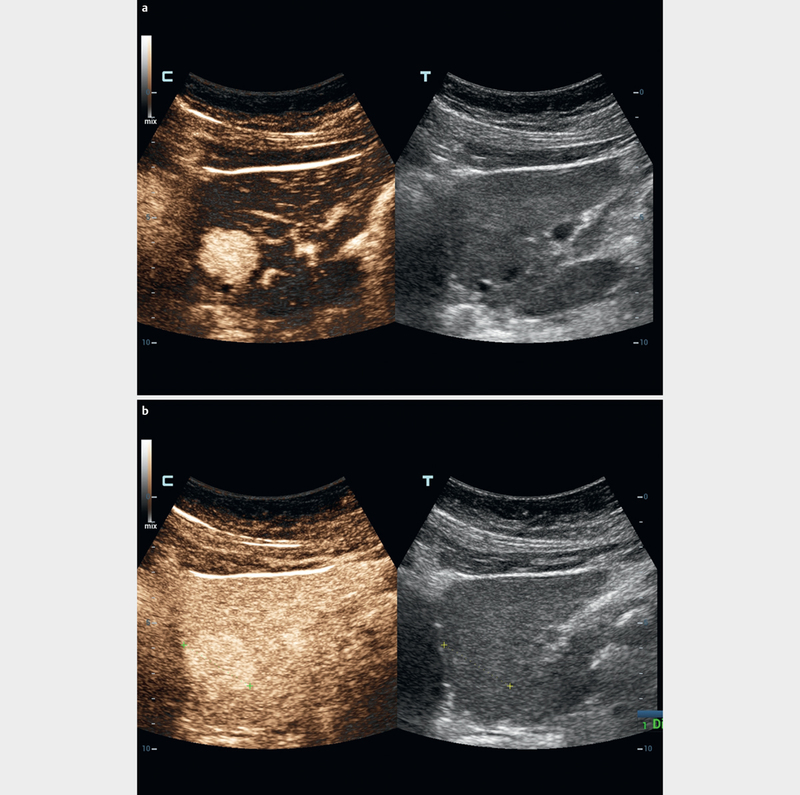 The following clinical applications of EV-CEUS have been described in case studies: percutaneous nephrostomy , biliary tract imaging via percutaneous transhepatic cholangiography and drainage (PTCD) , abscess drainage , swallow CEUS for imaging Zenker’s diverticulum, voiding vesicoureteral reflux sonography  , salivary gland duct imaging , contrast-enhanced hysterosalpingo-sonography (CE-HyCoSy , biliary tract imaging via endoscopic retrograde cholangiography (ERCP)  and fistula imaging . The transducer used in extravascular CEUS is the same as that used in conventional US. SonoVue™ is currently the most often used UCA for VUR  though it is not licensed for other extravascular indications of CEUS. To date, no standard dosage of UCA has been established for extravascular CEUS. The reported range is 0.1 ml–1 ml SonoVue™ (most commonly just a few drops) diluted in 50 ml or more of 0.9% saline. A higher content of SonoVue™ may be needed for high frequency US probes . Compared with X-ray contrast techniques, EV-CEUS does not require exposure to ionizing radiation and can be performed at the bedside. The World Health Organization (WHO) estimates that 2/3 of the world’s population lacks access to medical imaging . Ultrasound (US) with CEUS may provide a way forwards. Investigators and clinicians wishing to perform CEUS examinations should gain experience by observing contrast studies performed by experts in the field . The diagnostic performance of CEUS is correlated with the observer's level of experience  . The examiner should also verify that his or her equipment is optimized for contrast examination and that the volume and diversity of cases will suffice to maintain skills. Practitioners need to be competent in the intravenous administration of contrast agents, be familiar with contraindications and be able to manage any possible adverse effects within the medical and legal framework of their country  . We refer to the educational activities of the collaborating societies of this paper, the World Federation of Ultrasound in Medicine and Biology (WFUMB)            , the European Federation of Societies for Ultrasound in Medicine and Biology (EFSUMB)                            and the CEUS LI-RADS Working Group for Liver Imaging Reporting and Data System (LI-RADS®)        . High-quality performance of CEUS is experience-dependent and requires regular use and understanding of the relevant physics, technical adjustments and contrast media variability. Each individual case requires detailed analysis of the enhancement patterns in all vascular and post-vascular phases. Despite the regulatory and practice obstacles for the use of UCAs for CEUS, the evidence indicates that CEUS can provide unique and accurate diagnostic information, in many cases also comparable and sometimes superior to the performance of CT and MRI   . Some authors declare conflicts of interest, which are available by the publisher and as supplemetary file. We were all saddened by the news of David Cosgrove's death in May 2017 following a gallant battle with cancer. David Cosgrove was an esteemed teacher, prominent researcher and a good friend. He will be missed by all. We express our sincere condolences.